In botany, this is the generic name of a number of beautiful plants belonging to the natural order of Iridaceae. The plants have a creeping rootstock, or else a flat tuber, equitant leaves, irregular flowers, and three stamens. They are represented equally in the temperate and hotter regions of the globe. The wild species of iris are generally called blue-flag, and the cultivated flower-de-luce, from the French fleur de Louis, it having been the device of Louis VII, of France. Our commonest blue-flag, Iris versicolor, is a widely distributed plant, its violet-blue flowers, as may be seen, upon stems one to three feet high, being conspicuous in wet places in early summer. The root of this possesses cathartic and diuretic properties, and is used by some medical practitioners. The slender blue-flag, found in similar localities near the Atlantic Coast, is smaller in all its parts. A yellowish or reddish-brown species, resembling the firstnamed in appearance, is found in Illinois and southward. There are three native species which grow only about six inches high and have blue flowers. They are found in Virginia ginia and southward, and on the shores of the Great Lakes ; these are sometimes seen as garden plants. 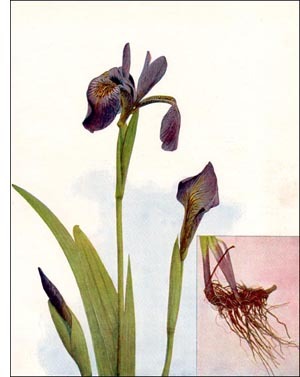 The orris root of commerce is the product of Iris Florentina, Iris pallida, and Iris Germanica, which grow wild in the South of Europe; the rhizomes are pared and dried, and exported from Triest and Leghorn, chiefly for the use of perfumers; they have the odor of violets. The garden species of iris are numerous, and by crossing have produced a great many known only by garden names. The dwarf iris, Iris pumila, from three to six inches high, flowers very early and makes good edgings to borders; the common flower-de-luce of the gardens is Iris Germanica; the elder-scented flower-de-luce is Iris sambucina.